Here’s a crochet pattern by Tonya Bush, filled with hearts (as fits the date): a scarf made entirely with corner to corner stitches. Tonya Bush at Nana’s Crafty Home. Reminds me of the pixel graphics of the computer games in my youth. In a completely warm and nostalgic way, of course! 🙂 I personally find heart shapes a little difficult to make with pixels (or quilting, knitting, crocheting, what have you) but Tonya’s are perfect. Plus, I love the shade of grey she chose. Visit Nana’s Crafty Home for the pattern (free, with ads) or buy an ad-free version on Ravelry. 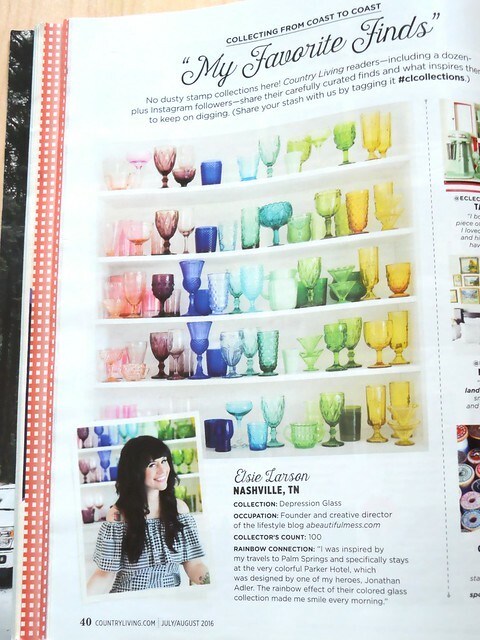 Mandi Gubler at Vintage Revivals. Hers are made from brass tubing and leather thongs for durability. I like the updated materials! I’m not so sure about the modern shapes, though – I’m fond of this particular Finnish tradition, but I do realize turning a traditionally-shaped himmeli into a planter would be very difficult (see some examples in a past post of mine). Visit Mandi’s blog for the video tutorial in stop-motion. Kristine at The Painted Hive (selection). Thank you for sharing these fantastic wall art pieces, Kristine! 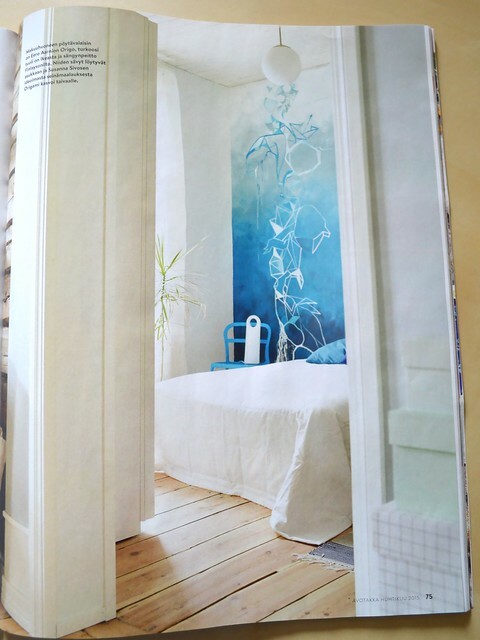 I was leafing through a home dec magazine looking for something else, when this wall with an ombre mural in blue, turquoise and white caught my eye. It’s from the home of designer Petri Hiltula in Finland. Sameli Rantanen / Avotakka magazine, April 2015. 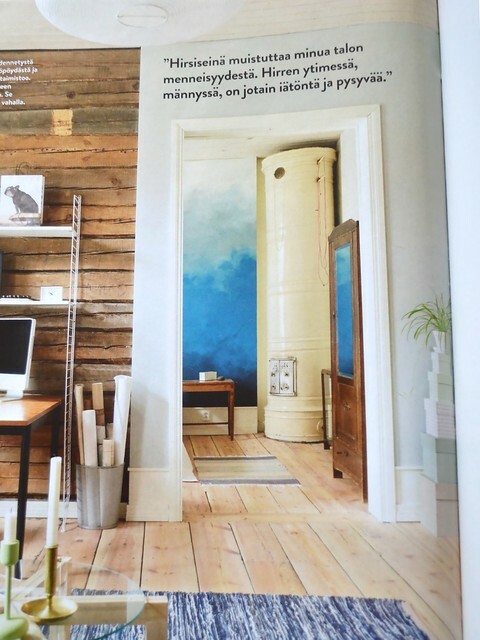 Featured in the Avotakka magazine (April 2015), the wall was designed by Susanna Sivonen. The name of the design is Origami kasvoi taivaalle (‘an origami grew into the sky’). The mural replaces the headboard in the bedroom. Gorgeous. At places the effect almost looks cloud-like due to the shapes in the paint treatment. The wall looks especially good in contrast to the plain white bedding, the original, exposed square log wall and wide plank floors. I think the extra-wide floor moulding is unusual these days, too, which contributes to the charm. Kudos! I love the sense of blue sky the mural creates; it’s especially nice at the end of winter. I’m hoping spring will come early this year! On Open Culture, Ayun Halliday writes about smartphones and creativity, extensively quoting cartoonist and educator Lynda Barry. Smartphone Rituals by Nicolas Nova on Flickr (CC BY-NC 2.0). I’m still mulling over the quote, but I seem to be leaning towards disagreeing. People who are inclined to doodle, people-watch, nap, let their thoughts wander, knit, read or whatnot will continue to do so even with smartphones. Not to mention that it’s perfectly possible to be bored with your smartphone and all the access it gives. Boredom, I find, isn’t dependent on having access to x, y or z; it’s more a matter of what doesn’t inspire you at any given moment. Nor are smartphones a cure-all against loneliness or uncertainty. 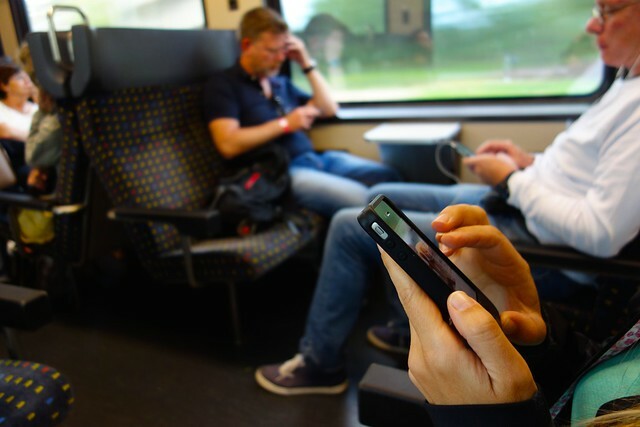 Smartphones are undoubtedly a tool, and equally unboubtedly they can be a distraction. My tentative hypothesis is that as the newest and perhaps most exciting devices in the history of human tool use, we haven’t collectively learned to balance their benefits and disadvantages yet. Of course, that doesn’t make it any easier for those struggling to resist the siren song of instant and interminable access.